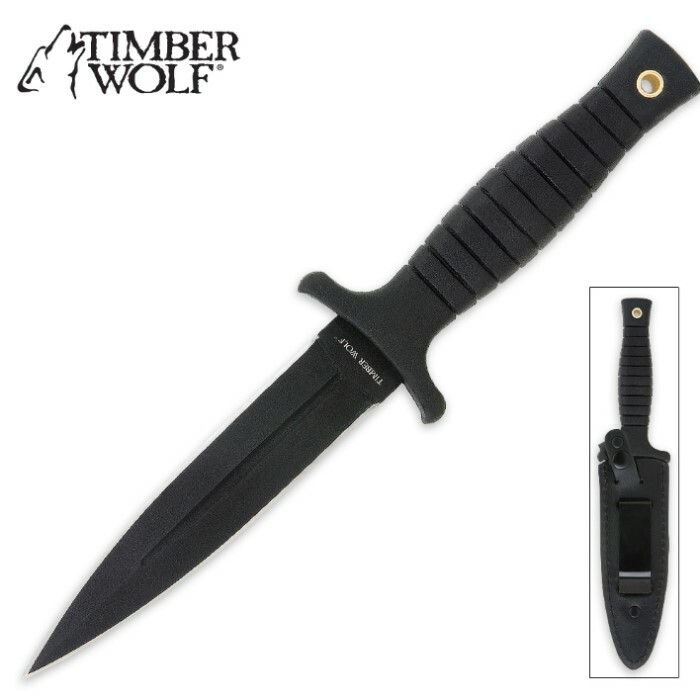 Timber Wolf Tactical Boot Knife with Clip-on Leather Sheath | BUDK.com - Knives & Swords At The Lowest Prices! This awesome Tactical Boot Knife by Timber Wolf features a genuine leather clip-on sheath that's perfect for any boot or belt. 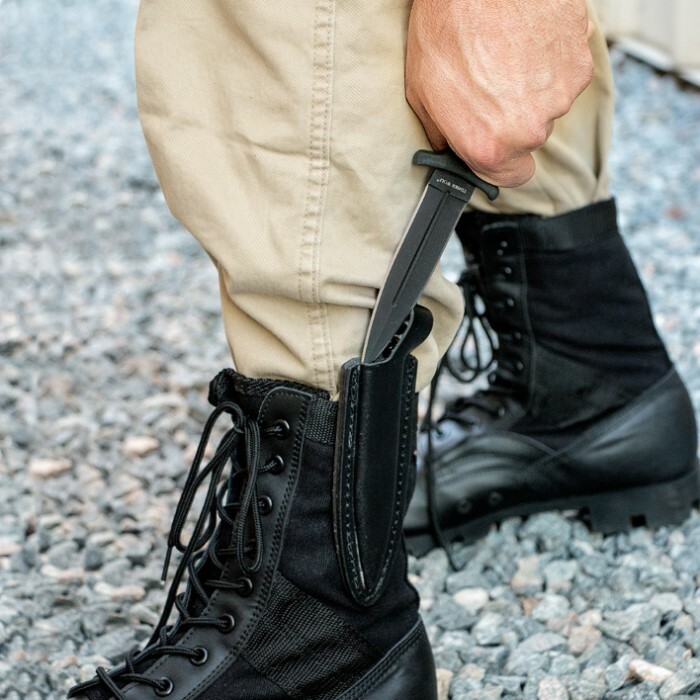 Just clip this 9" boot knife anywhere and you're prepared for any attacker. It boasts a 5" double edged stainless steel spear point blade and a no-slip rubberized handle with guard and brass lanyard hole. Reliable, sturdy, feels great in the hand. Been keeping it close for about 3 years now. The quality sheath stays where you put it. I love Timber Wolf knives! Great, Big double edge dagger. Very sharp. The sheath is great and the clip is so secure. I clipped to my $300 danner boots and never take it off. I probably need a lot more of these. I bought this to compliment the recent saber you guys released. This could find its way into someone with ease, it is no toy! If I ever have to defend my territory in medieval fashion, between the Combat Commander saber and this knife, I would have confidence in a victory in spite of many odds. got this in the mail yesterday and i was blown away .....sharp as a razor out the box....the sheath is awesome...this will be my new conceal carry knife....wife loved it so much we ordered another last nite.....great job budk. It is a tough little blade. It came fairly sharp already but I, ofcourse, sharpened mine a bit more. A nice grip on the rubberized handle. Very unbalanced, but doesn't matter much for what it is. Does not appear to be full tang, maybe half? Either way it doesn't specify. TW213 Stainless steel blade, handcrafted in China. 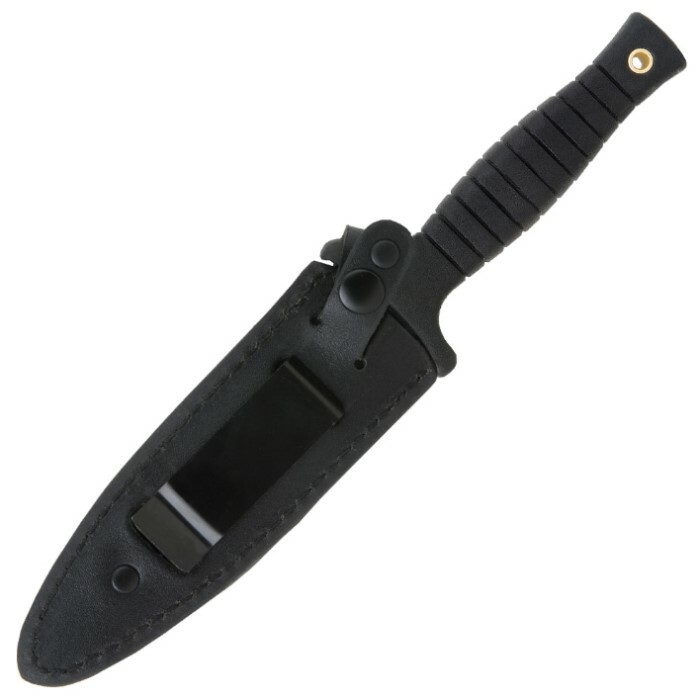 Reliable leather sheath, and excellent clip, STAYS on whatever you can clip it to. My opinion is, it's a GREAT KNIFE, GREAT BUY. great knife I love it. if you have huge hands this knife might not be for you. the handle is a bit on the small side. The blade is nice and solid but I haven't hacked through any trees or any thing just small branches the sheath is the perfect thickness. and it houses it with room to spare but it still stays snugly in it. hope this helps I would tell about this knife to a Friend. This is the first knife I have received from bud k that I have not absolutely adored. I had no idea the middle of the blade is plastic. The knife waa pretty dull, and mildly mishapen. Once again Bud K said they have no problem rectifying the situation. That reason and the fact thay Bud k has great knives majority pf the time is why I am repeat customer. The rest of my order was superb. I bought one of these knives a year ago, and it was probably the best knife I owned. I had it for a few months, before someone borrowed it to try to open a safe they forgot the combo to and didn't have the key for, and damaged it. I recently bought another one, because no knife I've gotten since has been able to fill the role of a boot knife quite like this one did. I would highly recommend this to anyone who wants a good knife, but doesn't want to break the bank. Knife arrived on time, and in perfect condition- decently sharp right out of the box. Sheath is of better quality than I expected for a $13 knife. I had to work the blade in/out of the sheath a few times to get it to seat,and allow the snap to close. Yes, grip is not the same size as, say, a full size Ka-Bar, but, hey guys, this is designed as a concealable item. I like heavy-bladed knives- this one is OK. at about 4 mm.thickness. This is a great piece, of good quality, and at a fair price. Superb! Best boot knife I own! CON: the rubber on the guard is too thin PROS: Sharp, Pointy, great leather, slim profile, strong clip, perfect handle, nice quick release!